This is a good addition to the genre of humorous tall tale westerns. Something of a cross between Little Big Man and The Sisters Brothers, Joe R. Lansdale’s Paradise Sky is the story of Nat Love, a black man, set shortly after the end of the Civil War who must flee his Texas home and takes off to the Wild West. As a story of a black man in 19th century America, there are, of course, sad moments, but Nat’s darkly ironic tone make for a read that hits many emotions from laugh out loud to frown in sadness or exasperation. In east Texas, shortly after the end of the Civil War, young Willie inadvertently looks at the hind end of a white woman which causes the lynching of his father. On the run and changing his name to Nat Love, he experiences ranching, buffalo soldiering and Deadwood, South Dakota, in its heyday. As a story of a black man shortly after the end of the Civil War, there are, of course, sad moments, but Nat’s darkly ironic tone make for a read that hits many emotions from laugh out loud to frown in sadness or exasperation. 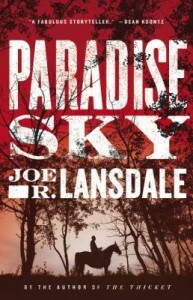 Joe R. Lansdale’s Paradise Sky is a welcome addition to the genre of humorous tall tale western in the tradition of Little Big Man and The Sisters Brothers. “Can’t cook, but doesn’t bite” attracts widower Oliver Milliron to the job advertisement of a for a housekeeping position in 1909 Montana. What follows is a delightful story about the family of father and three sons, their housekeeper and her brother, who takes the job as the school teacher in the one room school. Doig’s language is breathtaking, his descriptions of eastern Montana a delight, and the reader learns a little about homesteading in the early 20th century. Check our catalog for The Whistling Season by Ivan Doig. If you’ve read Doctorow’s recent novels, you may want to go back and read his first novel Welcome to Hard Times. If you like westerns, you’ll enjoy this book. 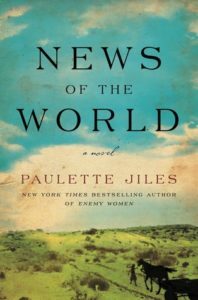 The story is set in a Dakota mining town and recounts the lives of people going west to find their fortunes. The hard times of western towns is portrayed though the characters’ personalities and and past experiences. The plot is suspenseful and the ending completes the circle from the beginning of the story. You’ll especially enjoy Doctorow’s wonderful words describing the scenes and people throughout the story. Visit the author’s website and read a New York Times review. McMurtry has written 29 novels (and more than 30 screenplays). Predominantly set in the American Southwest, McMurtry’s novels are as much about the place as about the people who live there. His depictions of harsh, rugged landscapes are beautifully written and give a balance to his hapless, roguish heroes and villains. Lonesome Dove, Larry McMurtry’s vast, wild tale of a cattle drive is full of action and unforgettable characters. The western epic won him the Pulitzer Prize. The story follows two longtime friends and former Texas Rangers, Woodrow Call and Augustus McCrae, at the end of the 1800s. Their lives as cattle ranchers along the Rio Grande have lost the excitement of their younger lawman days, so they set off on a long and difficult cattle drive to Montana. McMurtry’s immense talent takes the myth out of the cowboy legend with such a master’s touch that the reader never feels the sting. His has the ability to create believable and lovable characters no matter what the setting. Larry McMurtry is one the finest writers in the world of American fiction. His novels are compelling, unforgettable, and fun. Check out the television drama based on the novel, read a review and preview the novel. This is the second in a series of novels about the Berrybender family’s adventures in the American West during the mid-19th century. I especially enjoyed listening to the CD version as each part is read in the character’s voice, and this book is full of characters. It is especially entertaining to watch the father pursue his two main loves: hunting buffalo and young women.